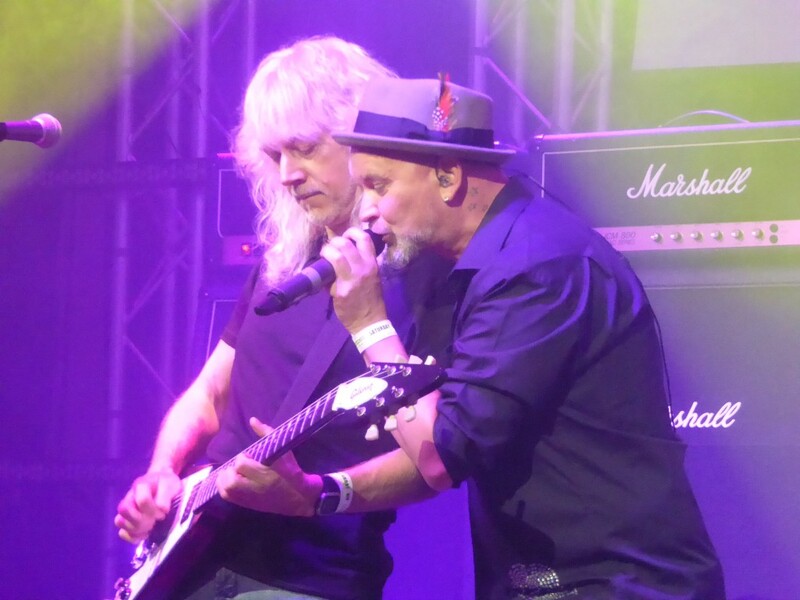 Share the post "Gig review: ROCKINGHAM FESTIVAL – Nottingham Trent University Students Union, 21-23 October 2016"
Last year, a new festival, Rockingham, took on the unenviable mantle of filling the void left by Firefest, which for a decade had delighted melodic rock fans by bringing a series of cult melodic rock acts, many reforming after years away, together with promoting a new generation of bands. With only a few tweaks to the formula, the new festival was successful enough to reach a second year, but this time there was a significant change. The venue switched from the traditional Rock City to an entirely new space within the nearby Nottingham Trent University consisting of a floor and balcony area. It showed a lot of potential with a big stage and cleaner, more up-to-date facilities, though seemed far smaller than the supposed 1200 capacity. In particular, the area in front of the stage, while wide, couldn’t have been more than 10 deep, and standing there felt like being on a crowded terrace when a non-league giantkiller hosts a big Cup game. The most significant teething problems though were with the sound, with particular issues with vocals and keyboards, though significantly they were all but resolved by the third day. A word too for the customer focus of the organisers, who were very efficient in processing advance merchandise orders for collection, handing out wristbands in the queue and generally taking away the hassle that can sometimes come with attending gigs. 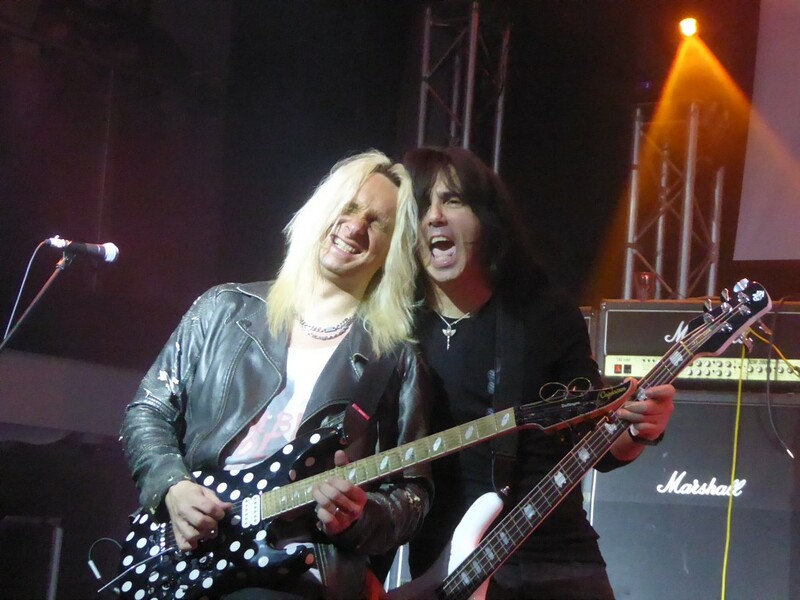 In keeping with scaling back the venue, the bill was somewhat more modest than last year’s ambitious effort which included big names like Dan Reed Network, Dokken and Cinderella’s Tom Keifer, while the Friday was reduced to four bands from last year’s six. The honour of opening Rockingham fell to Art Nation, the latest in a seemingly endless production line of young Swedish bands. They were rockier than I had expected and started well with ‘Need You To Understand’,’ I Want Out’ and ‘Start A Fire’, while ‘All In’ had a more melodic hook that reminded me of From the Fire. 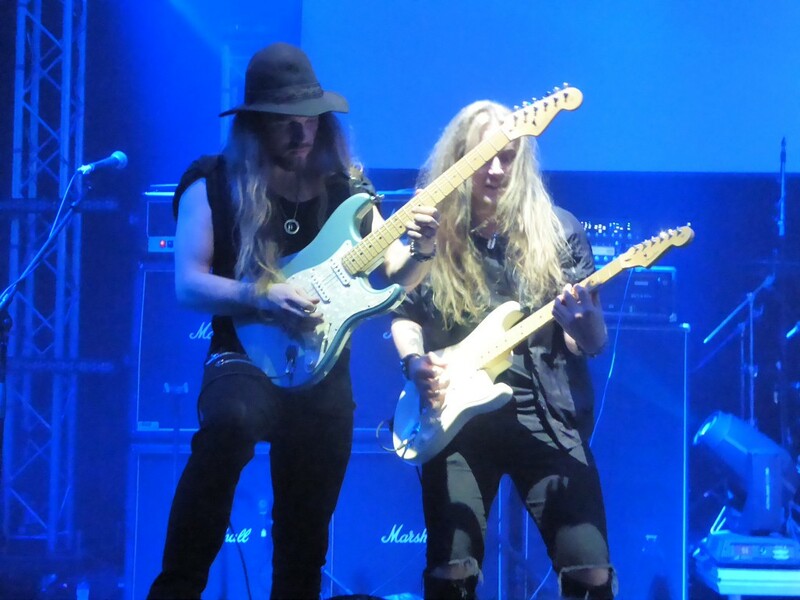 With singer Alexander Strandell impossibly youthful but having a strong stage presence, and two long-haired lead guitarists in Johan Gustavsson and Christoffer Borg, comparisons with a young HEAT were inevitable. ‘Wage War Against The World’ showed their heavier side, and they were confident enough to even close with some audience participation during ‘3000 Beats’. They lacked the distinctive element needed to separate them from their counterparts, but a very enjoyable set had got the festival off to a good start. 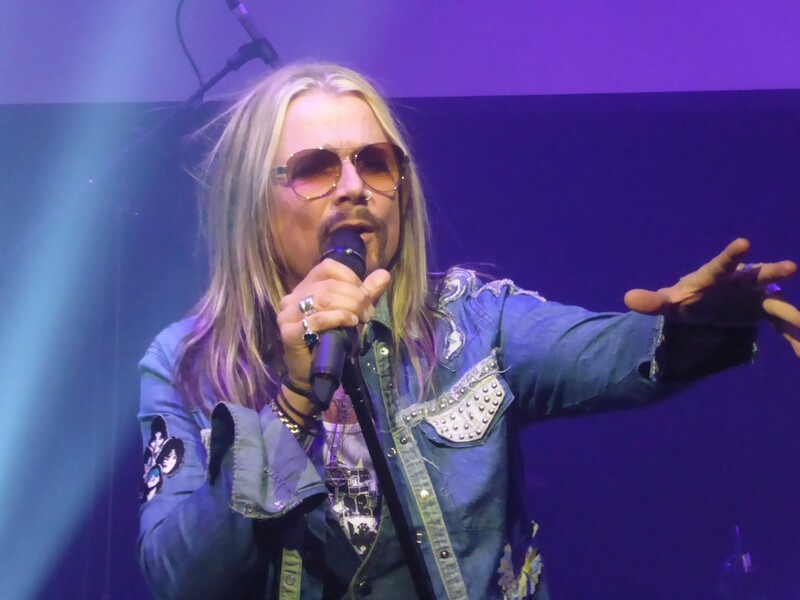 Next up was the only repeat from last year’s Rockingham in Robby Valentine and his eponymous band, all sporting clothes with his ‘V’ logo in the style of some cult sixties Sci-Fi series. The androgynous Dutchman was always going to divide opinion here as his genre- hopping music is outside the safer boundaries of the melodic rock mainstream. At times he reminded me of Muse, at other times the theatrical sounds of a Queen and Meatloaf were the dominant influence. His voice seemed better suited to the softer songs, often delivered at piano including the very Mercury-like moving tribute ‘Dear Dad’, and ‘I Believe In Music’ including some classically-inspired ivory tinkling. 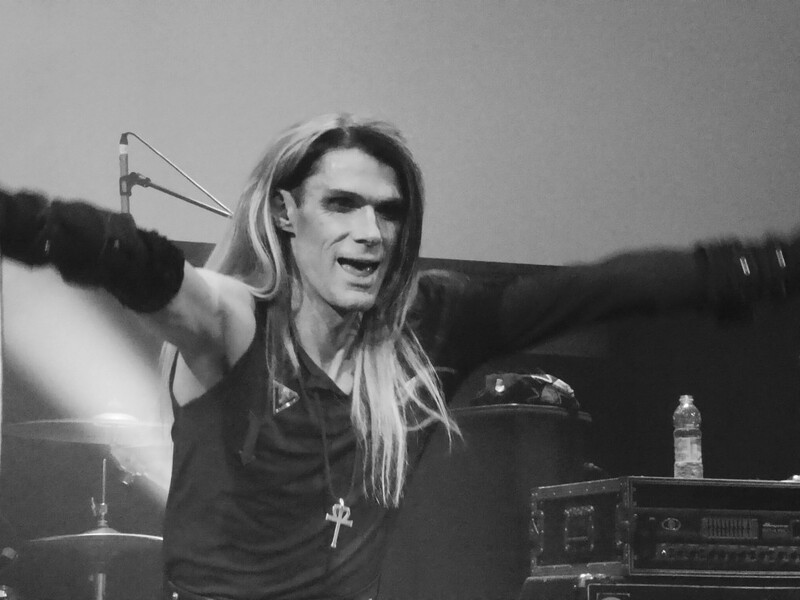 However on the heavier material it was a bit thin and he was indebted to crimson-haired co-vocalist Maria Catharina whose powerful, semi-operatic style gave the likes of ‘Rockstar’ and ‘Fear Of Heights’ a symphonic rock feel. Songs like ‘Close The Door’ really made an impact on me as they progressed and ‘Black Rain’s repetitive chorus succeeded in getting people to song along. As is his trademark, we got a Queen cover- not ‘Bo Rap’ this time but the more connoisseur’s choice of ‘Ogre Battle’, and ‘Save Myself’ and an encore of the lush ballad ‘Over And Over Again’ ended a varied and impressive set, which I enjoyed much more second time around thanks to my greater familiarity with the material. One of those cult figures that Rockingham- and before it Firefest- specialise in bringing back from obscurity was next in Lee Aaron. Given that its 30-odd years from the days when many teenage Kerrang! readers of my generation had her pin-up on the wall, and that from the nineties she diverted into jazz before raising a family, this had the potential to be something of a car crash. How wrong any doubters were: from the moment she bounded on stage to the Avril Lavigne-esque ‘Tomboy’, it was clear the years had been kind to her. 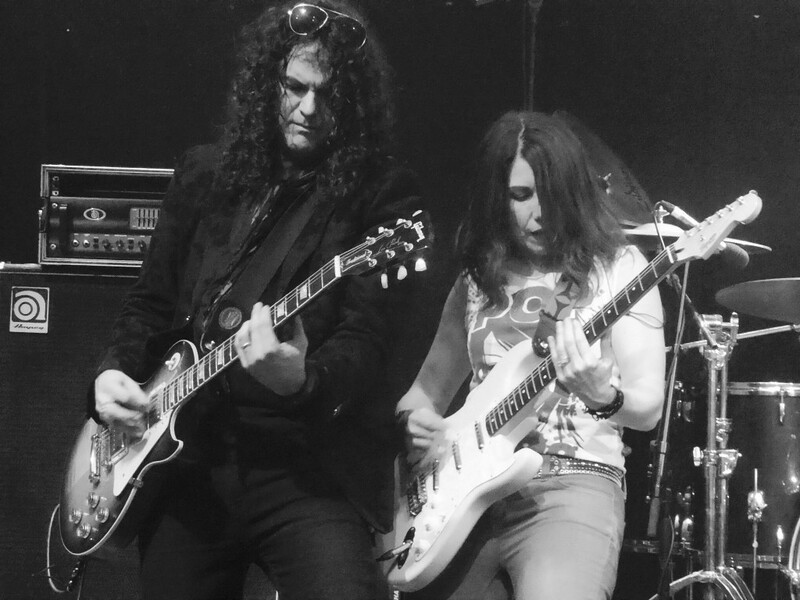 In addition she had a winning easy charm and her band were excellent, notably Crash Kelly guitarist Sean Kelly. Old favourites soon followed in ‘Hands On’ and her cover of ‘Rock Candy’, but the new material was surprisingly good, albeit in a bluesier fashion, with ‘Fire And Gasoline’ and a smouldering ‘50 miles From Memphis’, showing off her raspy voice in a manner one friend likened to fellow Canadian Sass Jordan. But the highlight for me was the classic keyboard/guitar intro to ‘Powerline’, though they did not see out the song as after its first massive chorus it segued into ‘Lady Of The Darkest Night’. Both ‘Watcha Do To My Body’, which I never realised was a huge hit in Canada, and ‘Some Girls Do’ had an Aerosmith-like sassiness. However even they were eclipsed by an emotional delivery of the epic ballad ‘Barely Holding On’ and the song that launched her, ‘Metal Queen’, closed proceedings, albeit now sounding rather dated, and there was plenty of air punching and singing along to the chorus. Her set was a revelation and I was delighted to be tucking into humble pie. Whereas Lee Aaron was a regular visitor to these shores in the eighties, this was Trixter’s first ever visit to the UK, perhaps accounting for their Friday night headline status. Having caught their high energy act in the States at Melodic Rock Fest in 2010, and being a big fan of their last album ‘Human Era’, I was eagerly anticipating them. However ‘On The Road Again’ was a very ordinary opener and the sound was also poor during ‘Rocking To The Edge Of The Night’. Disappointingly it also proved the sole song from the last album: a set very heavy on their 1990 debut may have been the kind that they trot out on the hair metal nostalgia circuit but not what I was hoping for, as in my view they have come back a more mature and effective band. Gradually the sound problems that plagued songs like ‘Heart Of Steel’ eased and they hit their stride notably with ‘Rocking Horse’, although the presence of dancers from a local Nottingham joint seemed unnecessarily tacky. 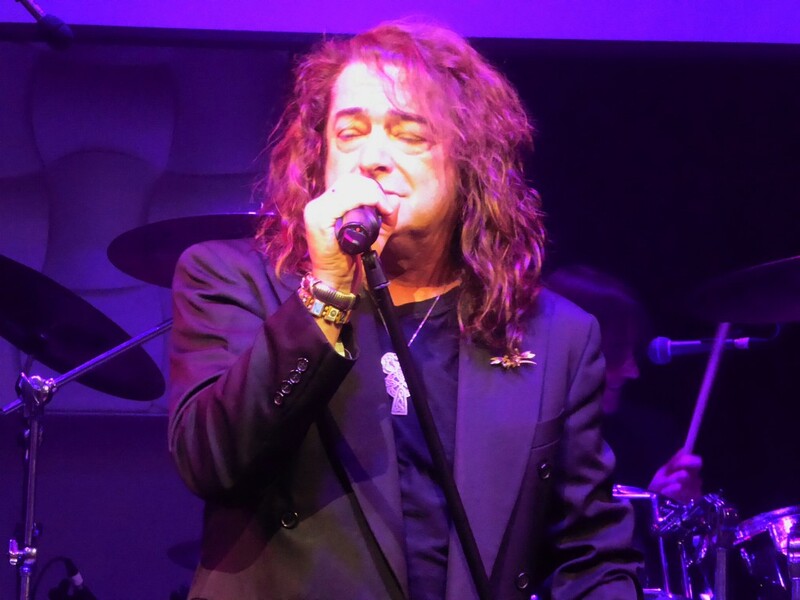 Pete Loran is a good frontman though I found myself making comparisons to Bon Jovi, partly with his rather nasal voice, and partly that the strength of the backing vocals from Steve Brown and PJ Farley suggested that he might not be the best singer in his own band. Meantime Mark ‘Gus’ Scott was a real powerhouse thumping the life out of his drum kit as well as being, shall we say, a bit of a ‘character’. The set gathered momentum with the mid tempo ‘One In A Million’ and I also really enjoyed the underrated ‘Road Of A Thousand Dreams’, while ‘Surrender’ might otherwise have been syrupy but had a truly superb closing solo from Steve which demonstrated why he was highly regarded enough to briefly deputise for Vivian Campbell in Def Leppard. They played a couple of tracks from their 2012 comeback New Audio Machine; ‘Machine’, and ‘Tattoos And Misery’, which with a slightly modern Foo Fighters feel but a storming hook-filled chorus that people picked up on, was the pick of their set. They closed in party spirit, with Steve diving into the crowd and those dancers again on stage, and though ‘Line of Fire’ was ordinary, their breakthrough, Firehouse-esque song ‘Give It To Me Good’ had an enjoyable feel complete with crowd participation. It had been a typically energetic display and a good UK debut but on the short side at little over an hour and not quite the stellar performance I had been promising people to expect. Day 2 opened with Rockingham trying to break the mould somewhat with young British band in Stone Broken, who are building something of a buzz on the live circuit. 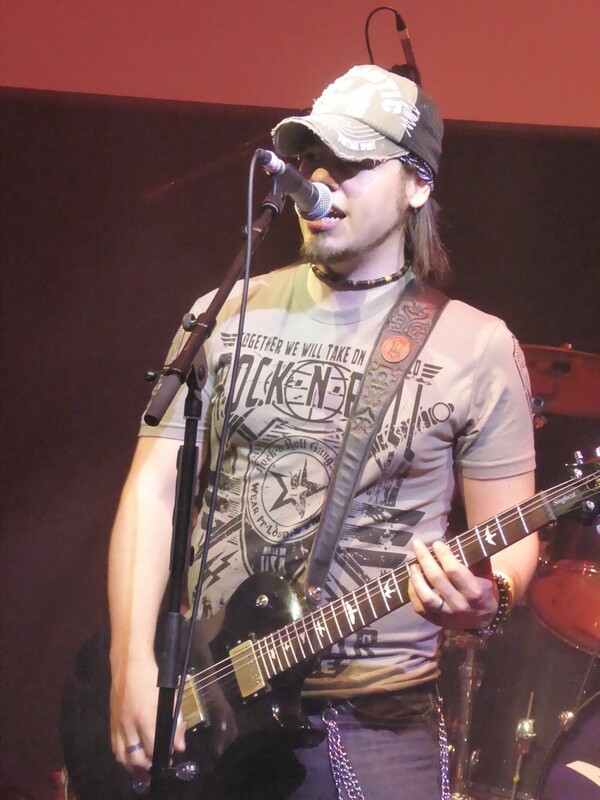 I could recognise the comparisons others had drawn to Nickelback and Black Stone Cherry, the no-nonsense approach, baseball cap and gruff vocals of singer Rich Moss certainly reminding me of the latter’s Chris Robertson. Surprisingly, it’s a relatively unusually rare furrow for a home grown act to plough but one that could pay dividends given the arena- selling size of the above influences on them. In front of a more traditional, and older, crowd they were always going to find it an uphill struggle but impressed with their freshness and commitment. After opening with ‘Stay All Night’ and ‘Better’, ironically the single ‘Wait for You’ sounded one of the weaker tunes. ‘This Life’ stood out as the set progressively suffered from being a tad samey, but it was set closer ‘Not Your Enemy’ that was the most convincing and even generated some successful audience participation, and all in all they did themselves great credit. Blood Red Saints may be at the opposite end of the age spectrum but their self-titled album has been one of the best British melodic rock releases of recent years. They started slowly with ‘Kicking Up Dust’ but ‘Mercy’ picked up the pace, with guitarist Lee Revill shining and far more extroverted than I remembered him on their shows earlier in the year. They also have the advantage that all band members chip in with backing vocals, giving the likes of ‘Dangerous’ a big sound. 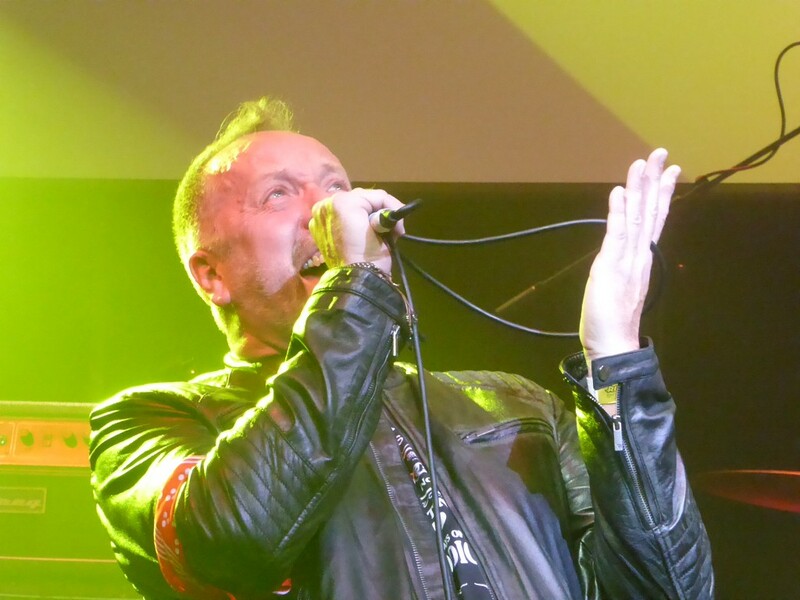 Their trump card is the brilliant vocals of Pete Godfrey who on ‘Best Of Me’- dedicated to those we had lost in 2016, including one of the stalwarts of this gigging community- even sounded like the great Steve Overland. However he will be most remembered for his stand up Northern comedy routine that had people in stitches and on social media he was even described as an AOR Peter Kay. Unfortunately his bandmate banter did rather eat into a short 40 minute set, so after a totally unnecessary version of ‘Wanted Dead Or Alive’ and an exuberant Paul Laine of the Defiants coming on stage to help out with ‘Unbreakable’ (the ‘heys’ sounding ironically Bon Jovi-ish), noises came from the side of the stage that they only had one song left and ‘Better Days’ hinted at a potential that was not fully realised. Perhaps the announcement that raised most eyebrows when the bill was announced was the return of Lionheart, over 30 years since the demise of the former NWOBHM band who went on to release a solitary, more AOR classic in ‘Hot Tonight’. Most of the original lineup were in place but with a new singer in Lee Small, whose high-pitched Hughes-esque tones have graced albums by the likes of Shy and Skyscraper, and whose trilby and stage movements give him the air of an artful dodger. Things could not have got off to a worse start with Steve Mann’s keyboard not working and Lee missing his first vocal cue, which meant that ‘Wait for the Night’ was less than the glorious piece of pomp the recorded version was. Both ‘Hot Tonight’ and ‘Die for Love’- where Steve’s guitar riff reminded me of ‘Beat It’- were much more guitar heavy than the originals while a song that never made it to album, ‘Prisoner’, had some great harmonies demonstrating what a bunch of seasoned professionals were on show, and Lee warmed to his task and gave a superb display of vocal acrobatics. Former Maiden guitarist Dennis Stratton seemed to be having the time of his life, though I was surprised to see his guitar partner Steve taking the majority of the solos, looking the old school rock god with his leonine mane crouched over a Flying V.
Their set was warming up nicely and after ‘Towers Of Silver’, ‘Another Crazy Dream’ led itself well to a sing-along while ‘Dangerous Game’ not least with its twin guitar intro reminded me of Praying Mantis. They closed with their eponymous song which was too old school NWOBHM for me, but it was a triumphant return, followed by even better news days later with the announcement that they would be sticking together to make a new album. In complete contrast at the age level of the spectrum Swedish glam rockers Crazy Lixx were next and the crowd had thickened considerably. The energy levels and on stage movement were perhaps the highest of the weekend, and even though openers ‘Rock And A Hard Place’ and ‘Lock Up Your Daughter’ were not necessarily the strongest or most original of songs I warmed to their Skid Row and Roxy Blue inspired aggressive sound and sense of showmanship, even if I could have done without more ‘dancers’ hitting the stage during ‘Hell Raising Women’. 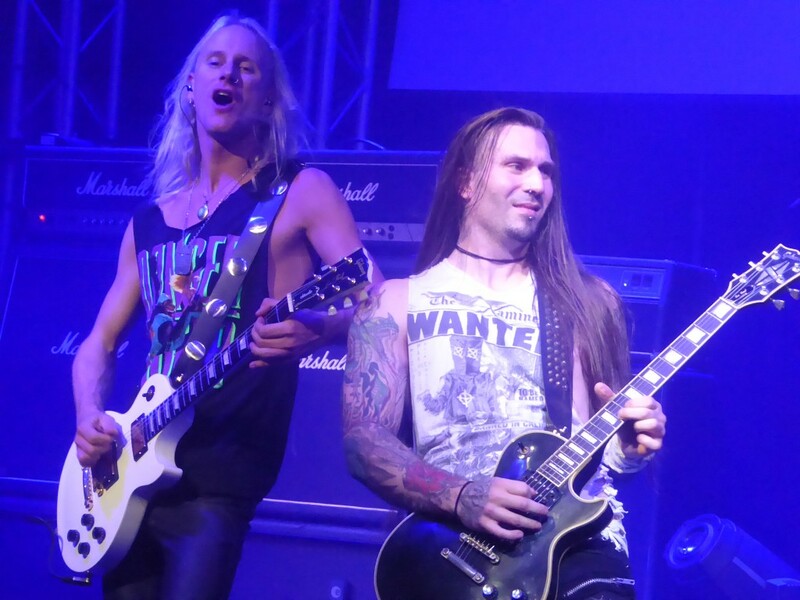 They had a dynamic stage presence with plenty of moves and great solos including the odd twin guitar such as on ‘Sound Of the Loud Minority’ from the new pairing of Chrisse Olsson and Jens Lundgren, to whom the song ‘All Looks No Hooks’ was dedicated tongue in cheek by singer Danny Rexon. The more sophisticated ‘Children Of The Cross’ and melodic ‘Blame It On Love’ added a sheen of class but it is the fist punching anthems of youth that they do best and ‘Heroes Are Forever’, ‘Girls Of The Eighties’ and the set closer ‘21’ Till I Die’ had people responding in kind. Even though this was not the first time I had seen them it was easily the most impressive and was setting the bar higher for the rest of the festival. I rushed back from a quick sandwich and football scores break into a crowded floor for The Poodles with many seemingly having rushed down from the balcony to be in the thick of the action for the popular Swedes. Singer Jake Samuel oozes rock star charisma and was perhaps the only person all weekend who could get away with triple rhinestone denim, while the band were extremely tight. After opening with ‘Before I Die’, the Hammerfall ish ‘Metal Will Stand Tall’ was a reminder that they have been on the scene now for a whole decade and had the whole crowd singing. They are difficult to pigeonhole within the genre, other than the strength of their songs with instant hooks like ‘Caroline’ and ‘Like No Tomorrow’. ‘Seven Seas’ with its insistent ‘Give it Up’ chant and ‘Night Of Passion’ had a fair few people bouncing up and down. It was a performance which justified the enthusiasm for them and possibly the best of the weekend so far. The charismatic Jean Beauvoir, with his magnificent Mohawk restored, rose to the challenge of matching it- while billed as a solo artist, this felt like a Crown of Thorns gig by any other name, what with Hawk Lopez on drums and Tommy Lafferty doing the first of his two weekend stints, and initially a setlist to match. However ‘Are You Ready’ and ‘Dying For Love’ represented a relatively slow start with Jean another singer done no favours by a mix that left his vocals sounding rather thin. 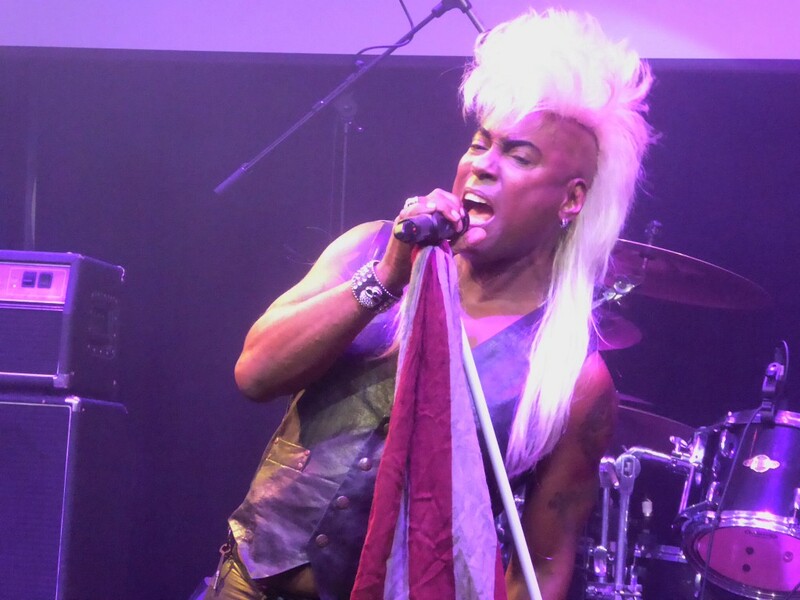 In fact his was a very diverse, career-spanning set, including a song from his Plasmatics days in ‘Masterplan’ and his co-write for Kiss, ‘Uh! All Night’, with bassist Dario Seixas helping out on the high notes- I initially expected more of an atmosphere, but by the end the crowd were completing the cheeky chorus themselves. There were rare opportunities to hear solo songs like ‘Missing The Young Days’ and, to the delight of many a dip into the’ Voodoo X’ album, plus a couple of film soundtracks in the funky ‘Feel The Heat’ and ‘Brain Hanging Upside Down’ which he co-wrote for the Ramones, surely the first song of theirs to grace a melodic rock festival! Crown of Thorns material was what the more casual fan wanted to hear and he obliged by pouring the heart of his soul into the ballad ‘Standing On The Corner For Ya’ alongside favourites like ‘Hike It Up’ and ‘The Healer’ (though I wish he would realise they made several albums and not only the classic debut!) But after the eponymous title track, a cover of ‘Rock And Roll’ seemed an unnecessarily lazy way to end an otherwise excellent set. As well as producing fine performances, all the acts to date had been graceful hosts, visibly enjoying performing before such a sizeable and receptive audience, smiling broadly and thankful for their moment in the spotlight. 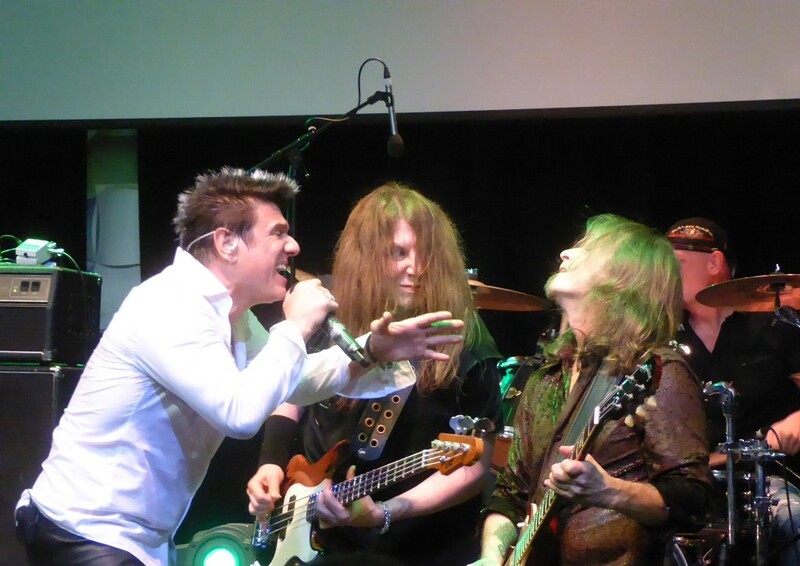 Headliners Steelheart , on an eagerly awaited first UK show for over 20 years came with a different attitude. As singer Miljenko ‘Mile’ Matjevic strutted on stage, in Soprano-style shades and long coat, and a hairstyle that one wag suggested he had bumped his head on a freshly painted door, it was clear that here was someone who still lived out the swaggering eighties rock star persona, something which the stage crew also had to contend with. After a grungy opener in ‘Blood Pollution’, there was another surprise in the Steel Dragon song, ‘Livin The Life’, which most of the Rockingham faithful would have been more familiar hearing Jeff Scott Soto perform. For the majority of people, the band never came close to matching their 1990 debut so ‘Gimme Gimme’ was a good sign, with gargantuan riffs from Kenny Kanowski channelling the spirit of Jimmy Page. However that was no excuse for a cover of ‘Black Dog’ only four songs in, and after another lengthy jam led into a drum solo the crowd at the front began to thin as- just as with Giuffria last year – they were getting a show other than the one they were expecting. To be fair, Steelheart belatedly turned things around starting with the US hit ballad ‘I’ll Never Let You Go’, showing that Mile certainly still has a powerful vocal range and can hit those trademark high notes as well as he could in the day. ‘Everybody Loves Eileen’ had the crowd singing and ‘She’s Gone’ was another ballad, albeit one that built up a head of steam in epic fashion. Another crowd favourite was ‘Stand Up’, one of several songs from the Rock Star soundtrack he sang on, while there were crazy scenes on the floor as he came through the crowd during ‘We All Die Young’ and everyone wanted a piece of his action. However, as with Trixter, their set barely tipped the hour mark and they blew it again with a perfunctory encore of a second Led Zep standard in ‘Immigrant Song’ when a number of debut album favourites (‘Love Ain’t Easy’ or ‘Can’t Stop Me Loving You’ to name but two) were crying out to be played. My experience of their native USA is that any Zeppelin cover leads to wild screams of audience delight there, and they may have wanted to pay tribute to them in their homeland. However, the Rockingham audience was a discerning one, loyal to these cult acts and would have preferred their own material, not stuff that they could hear any night in their local pub. After a patchy performance the verdict on Steelheart was primarily one of disappointment. 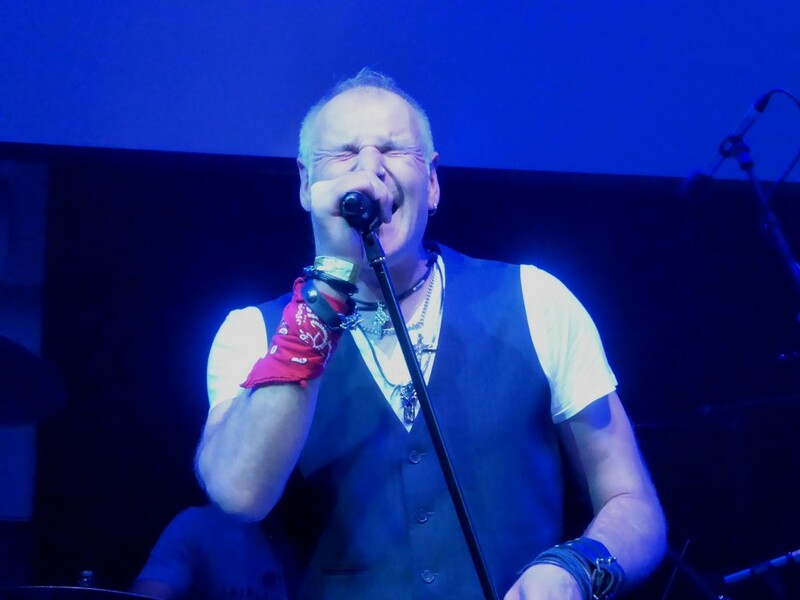 After a night spent rocking out to melodic rock classics in the ‘Forever Young’ club night at the Salutation Inn, it was perhaps a good thing that Sunday proceedings opened an hour late. As on Friday, some Scandi rock opened proceedings in the raven haired form of Martina Edoff, a seasoned figure in Sweden whose two recent albums have been well received. Further interest came in her band including three members of HEAT, including returning guitarist Dave Dalone, so it was a chance to get reacquainted with his guitar style. As well as a gentle manner she has a pleasant voice and indeed the opening song ‘Unity’ had me thinking of a rockier version of Abba, but others such as ‘Never Let You Down’ and ‘Caught In The Middle’ had a tougher rock credibility. ‘I Am Mining’ had a big hook to it while ‘Come Alive’ Was a rousing set closer. As with Art Nation her set trod no new ground but was extremely listenable and whetted the appetite nicely for the pleasures to come. The sole home representatives of the day Angels Or Kings were following up their triumphant return from the wilderness at Firefest a couple of years ago, and had a lot of local support. However I found the genial Mancunians perhaps my least favourite act if the weekend, appearing less polished and professional in both musical and presentational terms than their continental counterparts, not helped by a number of technical issues. Raspy voiced singer Baz Jackson gave his all, veins bulging, and there were some highlights such as opener ‘Any Other Girl’, the more AOR ish ‘Ice Turned To Rain’ and the huge hooks of ‘No More Faith To Lose’, the opening cut to their new ‘Go Ask the Moon’ album, but at other times they came over as being a bit disjointed. 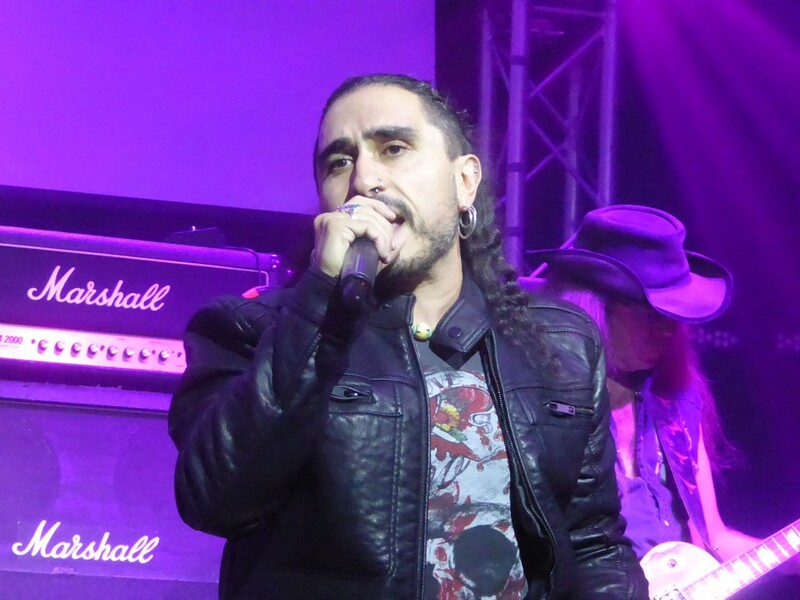 The Alessandro Del Vecchio Band were an unknown quantity: better known as a writer, producer and keyboard player for endless bands, mainly on Frontiers Records’ roster, he did however show on a cameo vocal appearance with Jim Peterik at Rockingham last year that he has a stunning, soaring vocal range. Generally the diminutive Italian vacated his usual keyboards to be front of stage, forming a little and large partnership with excellent rangy guitarist and Ted Nugent lookalike Howie G, and holding the crowd spellbound as in fluent English he told the stories behind a series of songs he had written for others. Opening with ‘Road To Nowhere’ and Revolution Saints’ ‘Back On My Trail’, these included a couple from the Edge of Forever project which I wasn’t previously familiar with including ‘Distant Voices’ and ‘Feeding The Fire’, and a pair from the brand new Hardline album, ‘Where Will We Go From Here’ and a moving ballad in ‘Take You Home’ where he took to the piano. ‘Turn Back Time’ from Revolution Saints was rapturously received as the chances of ever seeing that supergroup as a live unit are close to zero, as was Hardline’s ‘Fever Dreams’, something of a modern melodic rock classic to end a short but highly impressive set, which was also the closest we saw all weekend in style to classic traditional hard rock. In mellower fashion Fortune were flying the flag for pure AOR in what I think was their first ever appearance on English soil. The bulk of their set was drawn from their cult classic 1985 self-titled album which was also disappearing like the proverbial hot cakes from the merchandising table. From a great opener in ‘Thrill Of It All’, they never seemed hurried and the arrangements gave the songs and individual instruments space to breathe, while singer Larry Greene sidled around the stage in a casual manner, looking a cross between Richard Marx and Kevin Cronin, as his band looked to be enjoying themselves. 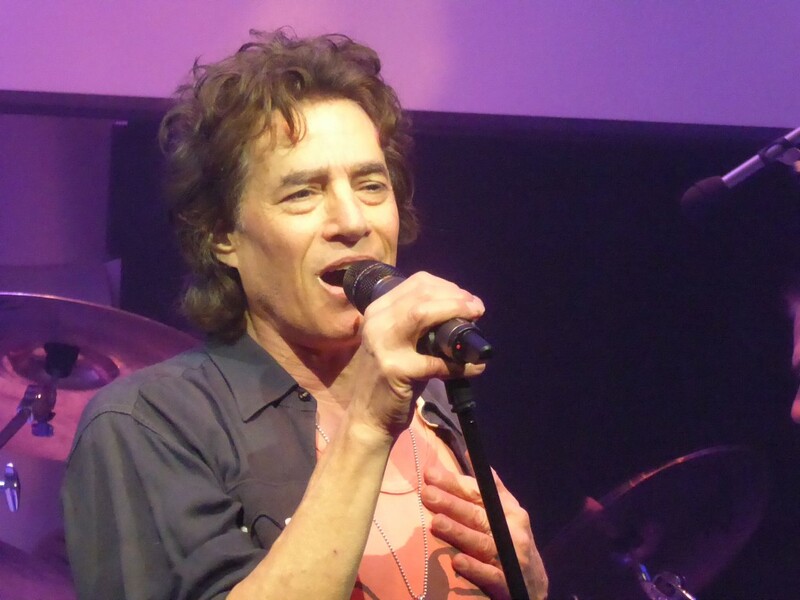 After a lull in the set, it really hit its stride with the classy ‘Dearborn Station’, ‘Deep In The Heart Of The Night’, and the first real ballad ‘Heart Of Stone’, all given the stamp of class by Larry’s smoky yet smooth vocals. We even got a new song ‘New Orleans’, while ‘Lonely Hunter’ rocked things up just a notch before the smouldering ‘98 In The Shade’. By the time they ended with ‘Out On the Streets’ which sounded as if it should have graced an eighties Hollywood action movie, they had won many new friends and admirers in addition to the select few who had been waiting 30 years for this moment. Two years ago, From The Fire staged a similar revival from the ashes at Firefest. This revitalised mainman JD Kelly – who seemed to be everywhere I looked in the crowd all weekend- and now they returned with a second and third album under their belt, and a new six piece line-up with a second guitarist in Brian McDermott alongside Tommy Lafferty. Whereas that time a band was thrown together with few rehearsals, on this occasion they sounded slick and polished. Swiftly shedding his snazzy jacket and glasses, like the proverbial off duty librarian, JD was a gracious host and switched between singing from his keyboard and taking a turn out front. They opened with a brand new song in ‘Madman’, but paradoxically, the songs from their 1992 classic ‘Thirty Days And Dirty Nights’ (sic) actually seemed to feature more prominently than last time. I was lapping up the likes of ‘Lovestruck’, ‘Hold On’ and ‘Over Your Head’ (all in the mould of White Sister) and ‘Tears Cried In The Rain’ which he reminded us was once voted No 11 in the top 25 ballads you have never heard of. A newer song, ‘Into Your Heart’, was an equally fine ballad. The band also have a keyboard player in Jenny Cue who intially looked rather disengaged, but was on belting form during the male-female duet ‘Spark And Flame’, and sang lead on ‘Cry For Me’ with a soaring, almost operatic voice. ‘Where Are You Now’ was another debut classic and ‘Never Be Lonely’ also impressed while JD took to piano to play ‘You Will Survive’, a moving tribute to Jimi Jamison, whose shadow still looms large over these gatherings. ‘Same Song’ got people singing along (I secretly hoped its writer Jean Beauvoir might have stuck around to duet) and they ended with a song I didn’t know but had impressed hugely, as the bar was being set higher with each succeeding act. The Defiants were eagerly anticipated, both as effectively a revival of the Paul Laine-led era of Danger Danger and because their debut album has been one of the melodic rock highlights of the year for many, myself included. ‘Grind’ was an underwhelming opener and ‘Underneath The Stars’ took a while to come to life, but they really came together during ‘Waiting For A Heartbreak’, one of many classics from the album. 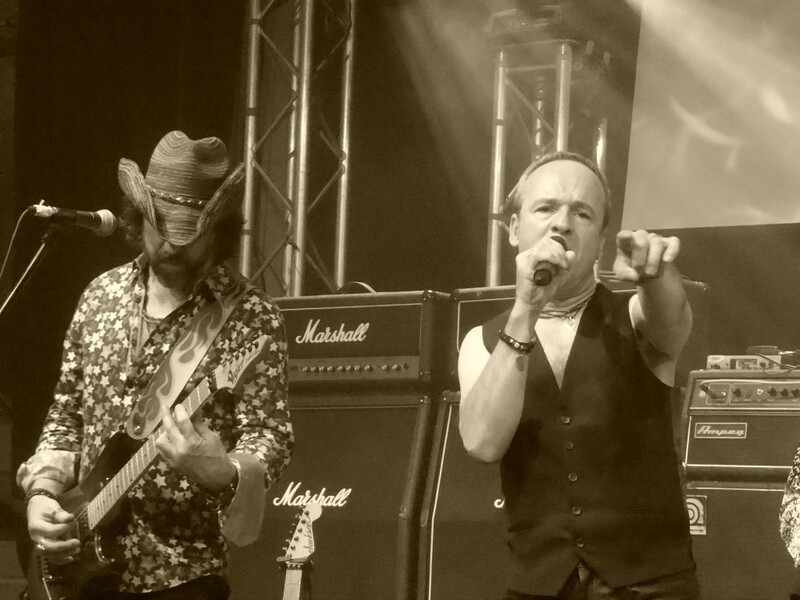 There was the usual on stage shenanigans associated with a Danger Danger show, orchestrated by Bruno Ravel and given extra edge by Paul’s intense, whiskey swigging wild man act. The thought occurred he should perhaps check his passport as his antics so contradicted the stereotype of the laid-back Canadian. The setlist was a touch controversial in that Defiants songs only formed a small proportion of the set, although ‘Take Me Back’ with its Bon Jovi-esque ‘heys’ and nostalgic lyrics went down extremely well. Instead it provided a rare opportunity to hear a couple of Paul’s solo classics in ‘We Are The Young’, the band getting into a real groove, and ‘Dorianna’, coming over as the archetypal eighties rock anthem, plus songs from a sadly underrated period in Danger Danger’s history such as the impressive ballad ‘Don’t Break My Heart Again’, and the autobiographical ‘Dead Drunk And Wasted’. ‘Going Going Gone’ saw Paul go into the crowd, perhaps at the expense of his singing accuracy and after ‘Love And Bullets’ came over better than on the new album, a joyous version of the one Ted Poley-era DD song, ‘Beat The Bullet’ closed a predictably full on and entertaining set, as Paul rather recklessly stood on the crash barrier hanging on to the crowd at the front. Such over the top antics were anathema to the Sunday headliner, Kevin Chalfant, making his first trip to the UK since a Two Fires gig at the old Gods festival in Wigan in 2000 (with Jim Peterik and Kelly Keagy in tow) went down in AOR history. He was content to let his silver-tongued voice do the talking and affected a studied, dapper nonchalance, hands in pocket of suit jacket. His connection to Journey is rather tenuous, so I viewed rumours that his set would primarily comprise Journey covers with a weary scepticism. This was overcome during opener ‘Separate Ways’, realising that he remains one of the closest matches to Steve Perry’s incomparable voice, and enjoying the visible delight that his all-British band- drawn from the cream of Blood Red Saints and Bailey and featuring two top guitarists in Adrian Boyd and Lee Revill – seemed to be taking from playing with such a legend. 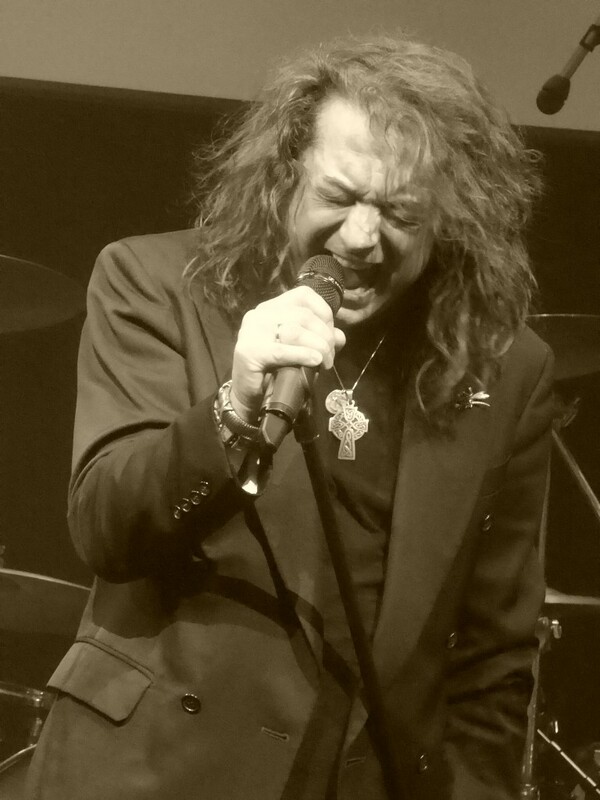 In contrast to Steelheart the night before, he did give the aficionados what they wanted with a pair of songs from first band 707 in ‘Can’t Hold Back’ and the anthemic ‘We Will Rise’, plus the bouncy chorus of ‘Keys To the City’ from the V.U. album (though the AOR anorak in me that remembered that it was played that Wigan night, contrary to Kevin’s claim it was its first airing in 30 years) and a Two Fires number in ‘My Love Will Be There’. However it was The Storm that really cemented his reputation as an AOR demi god so the biggest cheer yet went up when he played ‘You Keep Me Waiting’. 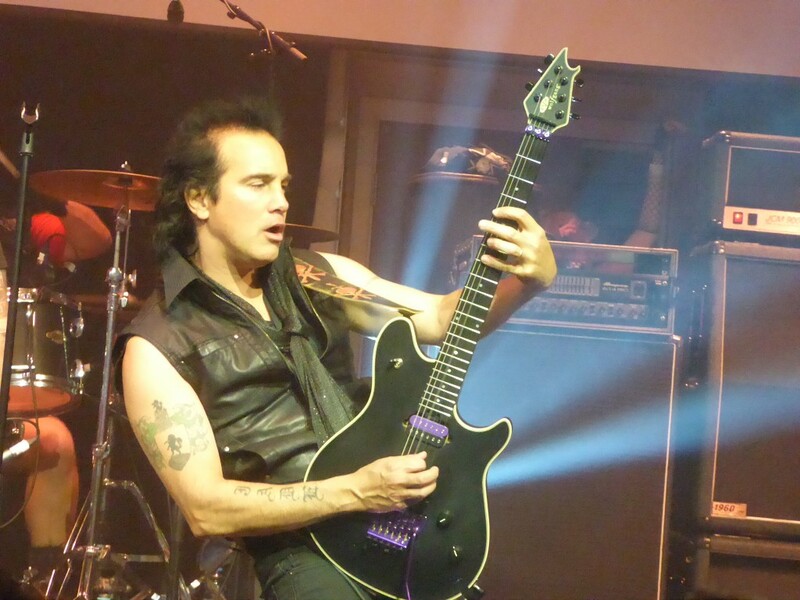 He also paid tribute to his friendship with Jimi Jamison – who I saw him perform alongside at Melodic rock fest in Chicago in 2010 – saying from here on in he would always include a Survivor song in his set, and a cover of ‘High On You’ was another that the backing band did thrilling justice to. He even dipped into his ‘Running With The Wind’ solo album, whose bluesier, more heartland rock sounding title track got better and better as it went on, while a third 707 song in ‘Megaforce’ had me racking my brains which Bon Jovi song ripped it off. Sadly in no time the set was coming to a close with the Storm’s US hit ‘I’ve Got A Lot to Learn About Love’ with Nigel Bailey playing the Gregg Rolie role with the lower register vocal tradeoffs, but there was still time for an encore in a cover of ‘Don’t Stop Believin’ which somehow seemed appropriate among this discerning audience of loyal long-time melodic rockers, with the band again seemingly having the time of their life. There was a bonus of another Journey song in ‘Lovin’, Touchin’, Squeezin’ complete with sing-along, though after a hard weekend I couldn’t keep my swaying arms in the air for very long! It was the perfect end to the festival to witness a true great of AOR. The consensus over my traditional post-gig curry with friends was that the names may not have been as high profile but the standard of acts at Rockingham this year was almost uniformly high, providing a memorable experience. In the final analysis the second year of the festival and first in a new venue had to be counted as a success, and it looks as if solid foundations have been laid for the long term. 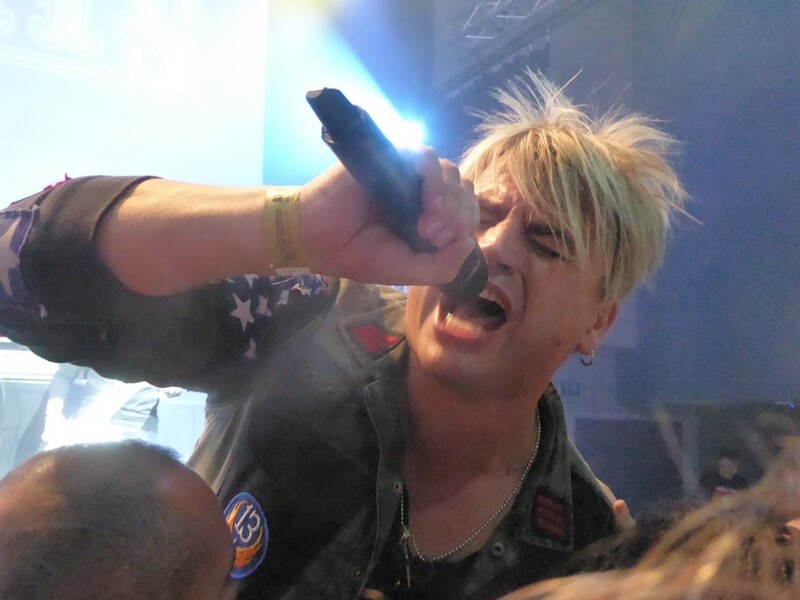 This entry was posted in All Posts, GIG REVIEWS and tagged Alessandro del Vecchio Band, Angels Or Kings, AOR, Art Nation, Blood Red Saints, Crazy Lixx, festival, Fortune, From The Fire, gig, Jean Beauvoir, Kevin Chalfant, Lee Aaron, Lionheart, Martina Edoff, melodic rock, Robby Valentine, Rockingham, Steelheart, Stone Broken, The Defiants, The Poodles, Trixter, Valentine. Bookmark the permalink.